Make merry, O barren woman, who before wast unable to bear a child! For, lo! thou hast manifestly conceived the lamp of the Sun, who will enlighten all the world, which suffereth from blindness. Dance thou, O Zechariah, crying out with boldness: He who will be born is the prophet of the Most High! 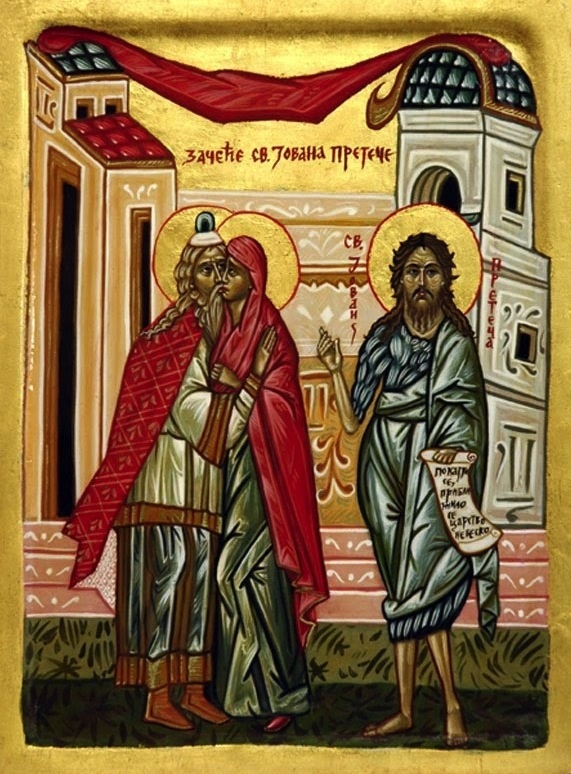 Rejoice with splendor, O great Zechariah and most glorious Elisabeth, his spouse, in conceiving John the Forerunner as is meet, whom the archangel announced, rejoicing. O ye men, let us right worthily honor him as the initiate of the mystery of grace. No Adult Education Class this week or next week. Next class will be October 10th. If you use cups or glasses on Wednesday nights (at Adult Education classes), please make sure you wash them and put them in the drying rack before leaving. Please stay for the Prayers of Thanksgiving following Liturgy. 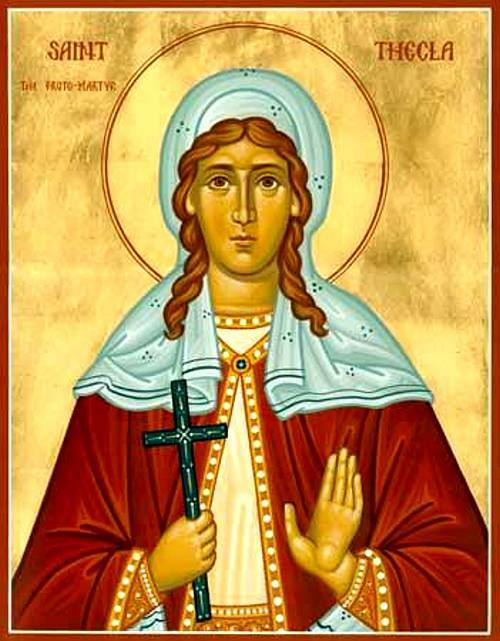 On September 24 the Church honors the Protomartyr Thekla (or Thecla), a young woman whose life was changed when she sat for three nights by her open window and heard Saint Paul preach. 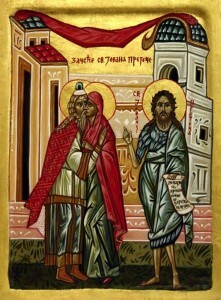 Thekla gave up her planned marriage, and accompanied Saint Paul as he traveled and preached. In later years she retreated from travel and lived a life of solitary prayer, escaping jealous pursuers by taking refuge in the opening in a rock that God provided for her. A young Orthodox woman wrote, a few years ago, about being part of a group that visited the cave in which Thecla lived. 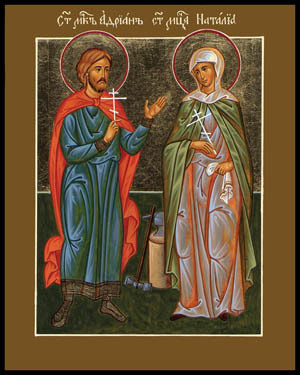 It is located in the desert village of Ma’aloula, Syria and is cared for by the nuns of the Monastery of Saint Thekla. Pilgrims constantly come to pray in the cave, and to drink from the spring that flows in it. It has been the site of numerous healings. At the further end of the cave is the chapel and the saint’s tomb. Nearby is a stack of crutches and canes that pilgrims have discarded because they no longer needed them after receiving healing in this cave carved from the mountain. Visitors can also go to the base of the mountain and walk into the opening that miraculously opened for Thekla, and make their way along a path, with water constantly flowing, inside the mountain. In places the path is wide enough for two to walk abreast; in others it is so narrow that a person is barely able to get through, face and body pressed against the stone. But the experience is an unforgettable one. We can only pray that with the terrible carnage and upheaval that has Syria in its grip, Ma’aloula will be able to remain a place where visitors can come so close to the life of a saint.